The World’s Greatest Amateur Racing Event! 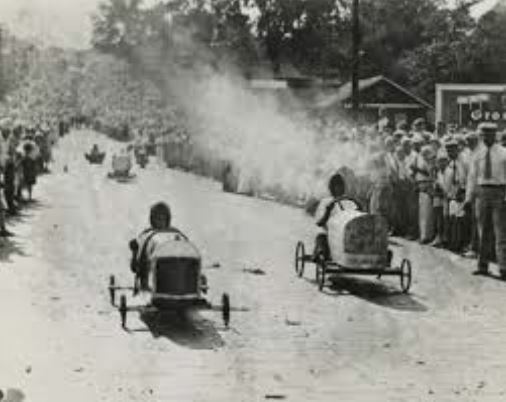 In 1933 several Ohio boys were racing down a hill with home-made cars they had built from scrap wood and leftover buggy parts. This was the early beginning for the All American Soap Box Derby — now an international competition like no other! From its early beginning, Soap Box Derby racing has enabled kids to gain important skills and experiences including engineering, science, mathematics, workmanship, craftsmanship, perseverance, and sportsmanship. For many, Soap Box Derby has inspired them into future careers as engineers, leaders, and entrepreneurs! Soap Box Derby racing in California has a rich history, many champions and future leaders have participated in the Soap Box Derby racing program. California racers are blessed with beautiful weather and plenty of hills, so racing is nearly a year round sport! Many chances for fun! The California Families Soap Box Derby Association is a volunteer run organization which serves to stage races throughout Southern California furthering the development of youth and family relationship. Soap Box Derby provides a unique opportunity for close adult child involvement as the “team” builds, fine tunes and races their car. The ties developed from these relationships last a lifetime as do the friendships formed as part of the derby experience. Please join our race family and become a part of the Greatest Amateur Racing Event in California.